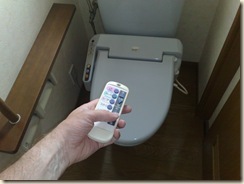 One of greatest mysteries I have yet to fathom is the remote control for the toilet. Yes, you read that right. Every throne in our new place is equipped with a multi-function electronic toilet seat (controlled by a com-poo-ter maybe?) that has a bewildering array of functions, most of which I can only begin to imagine. I’m sure Captain Kirk has something similar – presumably equipped with a function for dealing with Klingons. At its most basic level, the humble toilet sea is equipped with a heater. This is one of those interesting ways in which the differences between the Japanese and English psyche are laid bare: To the Japanese, a warm toilet seat means comfort and convenience; to the English it generates unwelcome mental images of a facility recently vacated by a 20 stone navvy. Pleasant though it might be to have your cheeks gently warmed, it’s in post-poo mode that the toilet seat really comes into its own, with its ingenious variety of cleansing functions. Now I’ve always been a bit wary of experimenting with this, mainly because the stop button is not always immediately obvious. It’s all very well having a spotless bottom, but the prospect of being stuck on the bog with Old Faithful shooting red-hot water up my jacksy, and not being able to get off for fear of flooding the khazi is the stuff of nightmares. However, following a brief instruction course from Big M, I now feel qualified to go solo. Basically, the controls are pretty straightforward: At the top, the all important Stop button; below it, the ancient Chinese symbol for “Wash Arse”. Below that, “Wash Fanny”. Big M recommends I don’t try the last option. So, this morning I had the first opportunity to tackle my chuff nuts the Japanese way. After parking my breakfast, I grabbed the remote control, gripped the seat, voiced a silent prayer and pushed the button. Nothing happened. I felt cheated. The cause of the misfire was a mystery, but I took it as a sign and left it alone for another day. I can report a successful first encounter with the Japanese grommet-washer. It was certainly a new experience! After the initial shock of a jet of water whooshing up the Khyber, I found it hysterically funny.